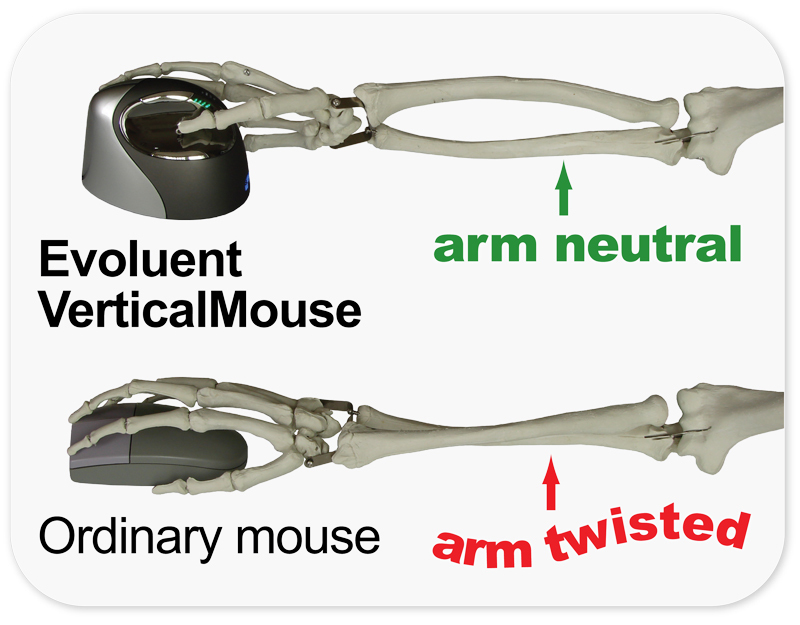 Maintains Blood Flow through the Wrist - Conventional horizontal mice cause the forearm to twist away from its natural position, which can reduce blood flow, contort muscles into awkward positions and increase the rate of fatigue. For many, this can result in discomfort and pain while mousing. 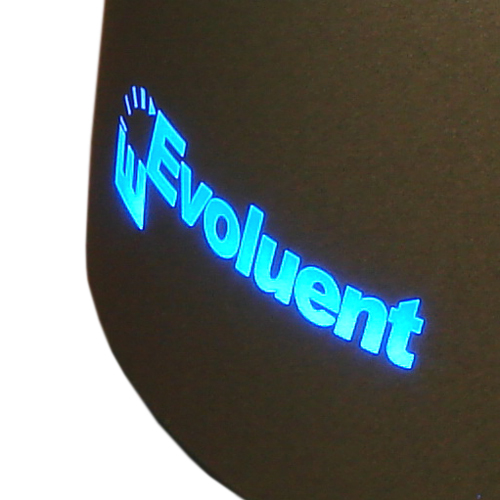 Eliminates Forearm Pronation - The design of the Evoluent VerticalMouse improves comfort and control when mousing, with a patented shape that supports the hand in a relaxed handshake position, and a sculpted “notch” for the thumb to rest in. 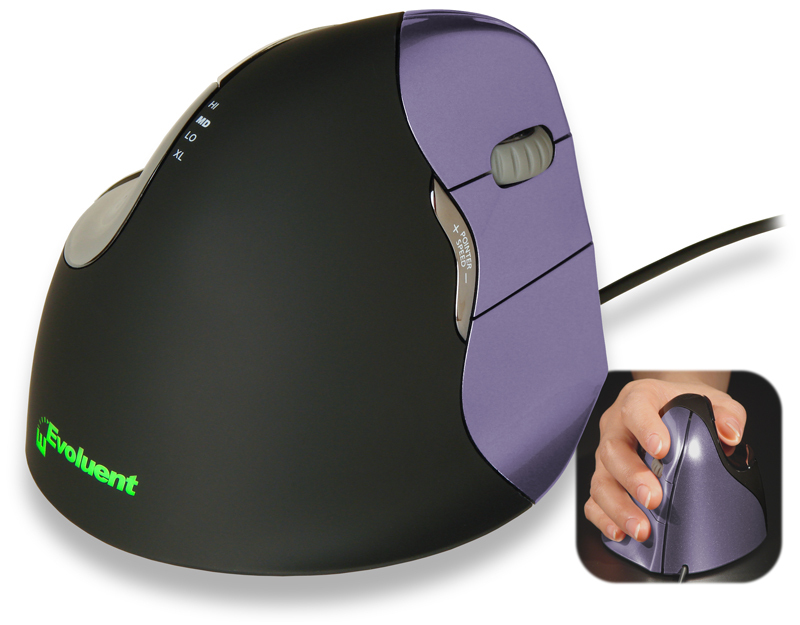 This innovative design eliminates forearm twisting and minimizes the effort required to use the mouse. Can Address Tennis Elbow (Lateral Epicondylitis) - The vertical orientation into which the Evoluent VerticalMouse rotates the hand is intended to address excessive tension which is put on the tendons and tissue of the forearm when the hand is rotated into the facedown position common in both mousing and keyboarding. This tension is known to commonly manifest in what usually referred to as "tennis elbow", where inflammation develops where the tendon attaches to the outer edge of the elbow. Eliminating the tension by addressing the pronation issue permits the tendon to relax and as the attachment point is no longer under continuous stress the tissue is permitted to rest and heal. 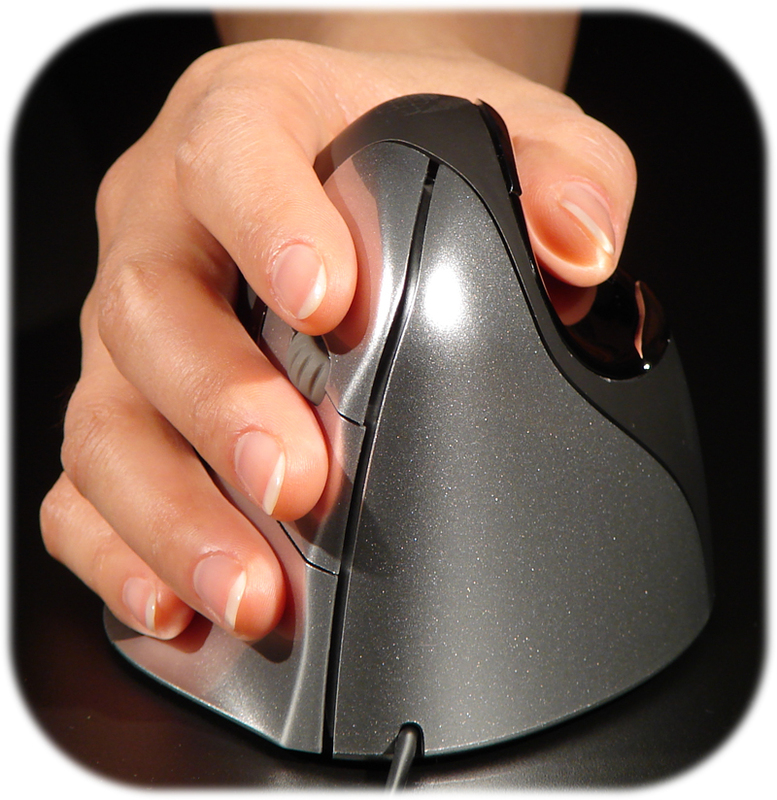 Cursor Stability - The mouse does not unintentionally move sideways when clicking with normal force because the thumb naturally opposes the finger movements. Encourages Load Balancing or Spreading with Software Option - Mouse Manager (Microsoft Certified) for Windows offers extensive custom, and even contextual, programming options yet is still easy to use through a simple and intuitive interface. Users have the option of reassigning button commands for load balancing or duplicating commands on multiple buttons in order to spread the load across multiple digits. The Mouse Manager software is also available for MAC OSX. Offers Alternative Clicking Options to Reduce Repetition - Automatically perform a single or double click by pausing the pointer. 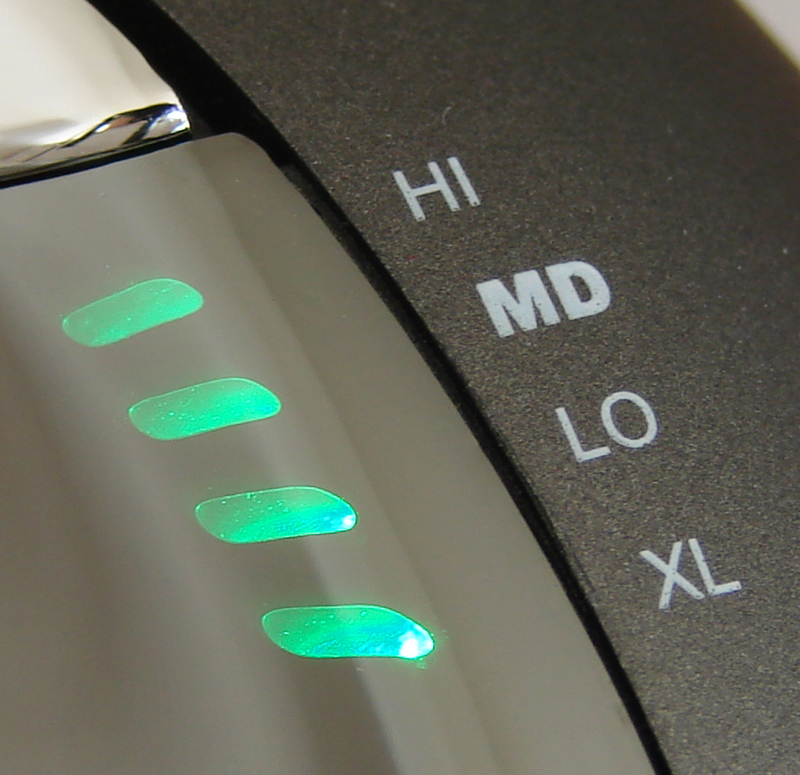 The time delay before activation is adjustable. 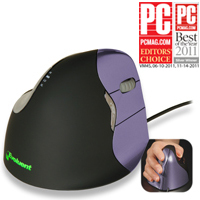 Alternatively, reassign commands to a different button or multiple bottoms to lighten or spread the clicking load. 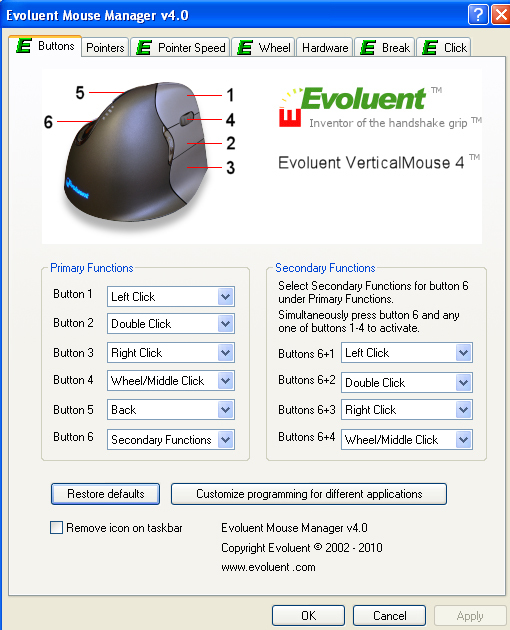 Note: Evoluent Mouse Manager Software required.